A strenghtening ridge moves from SW Europe and Mediterranean towards central Europe. An upper low with cold front enters W Iberian peninsula while another deep upper low with a strong surface cyclone and sharp cold front is moving across W Russia. Atthe surface, the cold frontal boundary extends from W Europe across CNTRL Germany into S Poland and CNTRL Ukraine. A SLGT risk has been issued for parts of central Europe with threat for isolated to scattered severe storms, capable of producing severe winds, large hail and excessive rainfall. Within a broad westerly flow, moderate shear will overlap with MLCAPE 1000-1500 J/kg as LL warm advection takes place on the nose of a building ridge from the SW Europe. Storm activity is expected south of the frontal boundary stretching W to E across the N side of risk area. 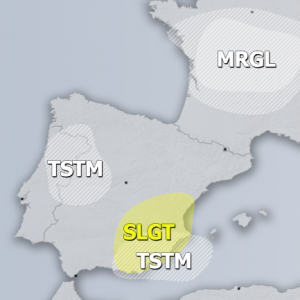 A SLGT risk has been issued for NW France where isolated threat for severe storms with large hail and severe winds exists. Despite models overdoing dewpoints, significant MLCAPE builds up with moisture return across W France. Favorable ESE low-level flow should enhance SR helicity and better storm organizating and some very large hail cannot be ruled out. Storms are expected in the late afternoon and should diminish in the evening hours. 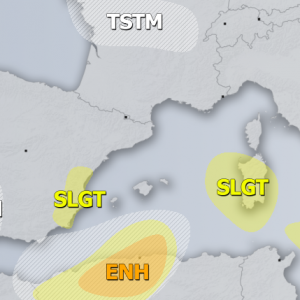 A SLGT risk has been issued for north-central Spain with threat for isolated to scattered severe storms, capable of producing large hail and severe winds. Given the inverted-V soundings, severe downbursts are possible locally. Storms should initiate in the mid to late afternoon, once the capping inversion weakens. 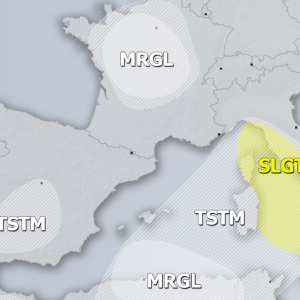 SLGT/MRGL risks have been issued for NE Turkey, Georgia into SW Russia where isolated severe storms are expected in the afternoon, as diurnal driven activity is likely to occur. Moderate shear and MLCAPE overlaps and support large hail, severe winds and torrential rainfall. ENH/SLGT risks have been issued for parts of W Russia with threat for widespread severe storms along the rapidly eastwards moving cold front. Fueled by strong instability and rather strong shear, numerous severe storms are likely. Main threat will be severe damaging winds, large hail and torrential rainfall. Good overlap of low-level CAPE and helicity should support some tornado threat as well. A MRGL risk has been placed across NE Scandinavia where some isolated severe storms are possible near the surface low and front, these storms could support some marginally large hail, severe winds and excessive rainfall as models simulate large area affected by high amounts of rainfall just north of the low.